Notes: This anime was viewed at its premiere at San Diego Comic Con 2002. There are actually two vocal tracks in the original Japanese. One features the main pair of voice actors hired to do this film - the other is voiced by the creator, Shinkai Makoto, and his wife. A high-school girl, Mikako, is called to help fight off an alien invasion, leaving behind her boyfriend, Noboru. She uses her cellular phone to send him periodic e-mails expressing her love for him. But though she feels the passing of weeks and months, he feels the passing of years due to the effects of time dilation. Even then, they realize that they can never truly be apart. Voices of a Distant Star is most definitely a labor of love. Virtually no anime can ever truly be a one-man job - even the Daicon reels and Wings of Honneamise were team efforts. However, this title bucks the trend in that it's a one-shot independent film that is almost exclusively the result of one man, the talented, albeit then-unemployed Shinkai Makoto, and his high-powered graphics computer ... okay, actually, just a MacIntosh. That's *it*. Given these circumstances it would be excusable for it to be a little less than the normal anime. Voices of a Distant Star is not normal anime. In the same amount of time (twenty-five minutes) that most anime titles use to barely scrape the surface of their worlds and stories, Shinkai Makoto leads you through a well-realized and intriguing universe, with likable and understandable characters, and a simple, bittersweet romance that will put tears in your eyes. This is, quite simply, the best one-shot anime release ever made. But wait, shouldn't there be budget problems? Lackluster music? Lack of voice talent? This guy had no budget, right? Well, perhaps the creator was constrained monetarily, but despite the relatively simple character designs and occasional pans for emphasis, you really can't tell that there was any such constraint. The voice-acting is remarkable, the directing is solid, and music is quite competent. But the real kicker here is the animation quality, which actually equals (and sometimes exceeds) that of excellent television series like Vandread and Full Metal Panic. I can think of many big-money productions can only hope to be half as good. And for how short this anime is, there is a remarkable amount of storyline; the plot is well-written and executed, and never gets a chance to be too drawn out. And Shinkai gives equal time to the slick action sequences and the well-handled, genuinely touching romance. The only regret, perhaps, is that there isn't any more of it - I would love to have seen this as a full-length feature film with a bit more exposition and explanation as to the nature of the alien threat. But ultimately, that's really not as important as the very involving long-distance romance between Mikako and Noboru. 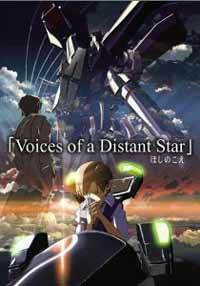 Voices of a Distant Star attempts more in a half-hour than most anime do in twenty-four episodes. But with the amount of care that has so obviously been taken in every single aspect of this movie, I don't think we should be so surprised that it succeeds - no - exceeds the ambitions it holds up for itself. I think the anime world will be seeing a lot more from Shinkai Makoto in the years to come. And this reviewer is definitely looking forward to seeing what he comes up with next. If this is any indication of what he's capable of, I would think that stardom isn't quite so distant for him. Recommended Audience: Though there is some violence during the fight between the humans and the aliens, this should be okay for older children and above.